The palmOTDR series are optical fault locating and analyzing tools for optical fiber network.With its excellent performance and higher user value, it offer an innovatory test method for telecommunication network. As a fault locating and analyzing tool much economical than traditional OTDR, the palmOTDR series feature hand-held, compact, lightweight and easy-to-use. The unique hot key design makes it faster and more convenient to review and analyze the event. 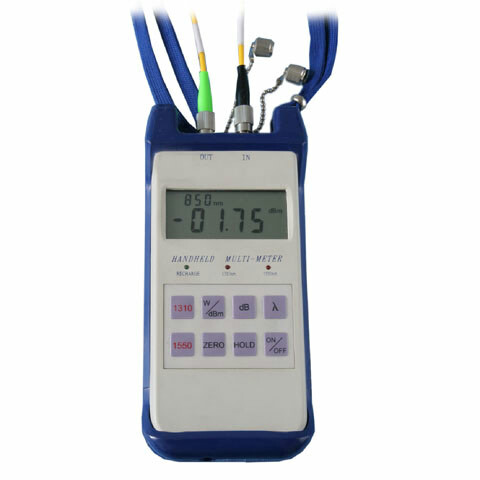 It has powerful functions, such as supporting averaging and real time test mode. And it can be used in both single mode (1310/1550nm) and multi mode (850/1300nm) fiber applications. With its multi-functional carrying softbag which is convenient for both field and lab testing, the palmOTDR series have become the indispensable and ideal tools for fiber networks construction, daily check and maintenance in FTTx, WAN and CATV systems. Besides, palmOTDR can save and transfer the measurement curves data to a PC by the software � Trace Manager +/- for further analyzing, reporting and printing. It successfully meets the requirement of different fiber connect type by simply changing different adaptors.